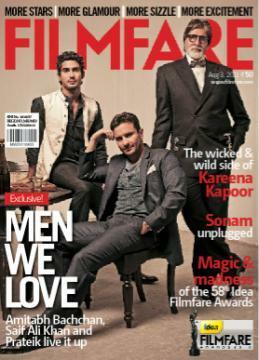 Saif Ali Khan, Prateik Babbar and Amitabh Bachchan will next be seen together in Aarakshan grace cover of Filmfare this month. I must say I totally dig this cover. It is the story of Anand Prabhakar, an idealistic principal of a college that has single handedly transformed the state's best college. Deepak Kumar, who can do something for her, Sir. Deepak Prabhakar love for her daughter Poorbi (Deepika Padukone), his friendship with Sushant (Prateik Babb). It is the story of their love, their lively friendship, their happiness. Prateik says he is curious about life, about work, about people. Filmfare'm curious to know about the youngsters' we all love to love. Local authorities demolished a large Aarakshan located in Bhopal. Demolition was ordered by the district magistrate's office. Patchwork scenes with Deepika Padukone and Saif Ali Khan was scheduled to be shot in the kit later this month. Prakash Jha Productions had taken land on lease from the terminal Residency Group did not realize that it was disputed property.